(2) If any earl, baron, or other person that holds lands directly of the Crown, for military service, shall die, and at his death his heir shall be of full age and owe a ‘relief’, the heir shall have his inheritance on payment of the ancient scale of ‘relief’. That is to say, the heir or heirs of an earl shall pay £100 for the entire earl’s barony, the heir or heirs of a knight 100s. at most for the entire knight’s ‘fee’, and any man that owes less shall pay less, in accordance with the ancient usage of ‘fees’. (3) But if the heir of such a person is under age and a ward, when he comes of age he shall have his inheritance without ‘relief’ or fine. (4) The guardian of the land of an heir who is under age shall take from it only reasonable revenues, customary dues, and feudal services. He shall do this without destruction or damage to men or property. If we have given the guardianship of the land to a sheriff, or to any person answerable to us for the revenues, and he commits destruction or damage, we will exact compensation from him, and the land shall be entrusted to two worthy and prudent men of the same ‘fee’, who shall be answerable to us for the revenues, or to the person to whom we have assigned them. If we have given or sold to anyone the guardianship of such land, and he causes destruction or damage, he shall lose the guardianship of it, and it shall be handed over to two worthy and prudent men of the same ‘fee’, who shall be similarly answerable to us. (12) No ‘scutage’ or ‘aid’ may be levied in our kingdom without its general consent, unless it is for the ransom of our person, to make our eldest son a knight, and (once) to marry our eldest daughter. For these purposes only a reasonable ‘aid’ may be levied. ‘Aids’ from the city of London are to be treated similarly. (14) To obtain the general consent of the realm for the assessment of an ‘aid’ – except in the three cases specified above – or a ‘scutage’, we will cause the archbishops, bishops, abbots, earls, and greater barons to be summoned individually by letter. To those who hold lands directly of us we will cause a general summons to be issued, through the sheriffs and other officials, to come together on a fixed day (of which at least forty days notice shall be given) and at a fixed place. In all letters of summons, the cause of the summons will be stated. When a summons has been issued, the business appointed for the day shall go forward in accordance with the resolution of those present, even if not all those who were summoned have appeared. (15) In future we will allow no one to levy an ‘aid’ from his free men, except to ransom his person, to make his eldest son a knight, and (once) to marry his eldest daughter. For these purposes only a reasonable ‘aid’ may be levied. (16) No man shall be forced to perform more service for a knight’s ‘fee’, or other free holding of land, than is due from it. (26) If at the death of a man who holds a lay ‘fee’ of the Crown, a sheriff or royal official produces royal letters patent of summons for a debt due to the Crown, it shall be lawful for them to seize and list movable goods found in the lay ‘fee’ of the dead man to the value of the debt, as assessed by worthy men. Nothing shall be removed until the whole debt is paid, when the residue shall be given over to the executors to carry out the dead man’s will. If no debt is due to the Crown, all the movable goods shall be regarded as the property of the dead man, except the reasonable shares of his wife and children. (32) We will not keep the lands of people convicted of felony in our hand for longer than a year and a day, after which they shall be returned to the lords of the ‘fees’ concerned. (35) There shall be standard measures of wine, ale, and corn (the London quarter), throughout the kingdom. There shall also be a standard width of dyed cloth, russet, and haberject, namely two ells within the selvedges. Weights are to be standardised similarly. (37) If a man holds land of the Crown by ‘fee-farm’, ‘socage’, or ‘burgage’, and also holds land of someone else for knight’s service, we will not have guardianship of his heir, nor of the land that belongs to the other person’s ‘fee’, by virtue of the ‘fee-farm’, ‘socage’, or ‘burgage’, unless the ‘fee-farm’ owes knight’s service. We will not have the guardianship of a man’s heir, or of land that he holds of someone else, by reason of any small property that he may hold of the Crown for a service of knives, arrows, or the like. (43) If a man holds lands of any ‘escheat’ such as the ‘honour’ of Wallingford, Nottingham, Boulogne, Lancaster, or of other ‘escheats’ in our hand that are baronies, at his death his heir shall give us only the ‘relief’ and service that he would have made to the baron, had the barony been in the baron’s hand. We will hold the ‘escheat’ in the same manner as the baron held it. (52) To any man whom we have deprived or dispossessed of lands, castles, liberties, or rights, without the lawful judgment of his equals, we will at once restore these. In cases of dispute the matter shall be resolved by the judgment of the twenty-five barons referred to below in the clause for securing the peace (§61). 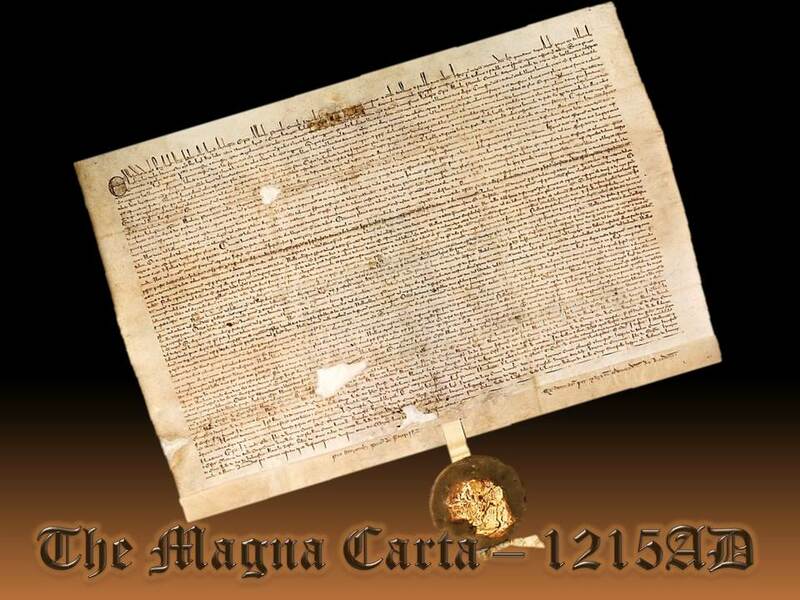 In cases, however, where a man was deprived or dispossessed of something without the lawful judgment of his equals by our father King Henry or our brother King Richard, and it remains in our hands or is held by others under our warranty, we shall have respite for the period commonly allowed to Crusaders, unless a lawsuit had been begun, or an enquiry had been made at our order, before we took the Cross as a Crusader. On our return from the Crusade, or if we abandon it, we will at once render justice in full. (53) We shall have similar respite in rendering justice in connexion with forests that are to be disafforested, or to remain forests, when these were first afforested by our father Henry or our brother Richard; with the guardianship of lands in another person’s ‘fee’, when we have hitherto had this by virtue of a ‘fee’ held of us for knight’s service by a third party; and with abbeys founded in another person’s ‘fee’, in which the lord of the ‘fee’ claims to own a right. On our return from the Crusade, or if we abandon it, we will at once do full justice to complaints about these matters. (55) All fines that have been given to us unjustly and against the law of the land, and all fines that we have exacted unjustly, shall be entirely remitted or the matter decided by a majority judgment of the twenty-five barons referred to below in the clause for securing the peace (§61) together with Stephen, archbishop of Canterbury, if he can be present, and such others as he wishes to bring with him. If the archbishop cannot be present, proceedings shall continue without him, provided that if any of the twenty-five barons has been involved in a similar suit himself, his judgment shall be set aside, and someone else chosen and sworn in his place, as a substitute for the single occasion, by the rest of the twenty-five. (56) If we have deprived or dispossessed any Welshmen of land, liberties, or anything else in England or in Wales, without the lawful judgment of their equals, these are at once to be returned to them. A dispute on this point shall be determined in the Marches by the judgment of equals. English law shall apply to holdings of land in England, Welsh law to those in Wales, and the law of the Marches to those in the Marches. The Welsh shall treat us and ours in the same way. (57) In cases where a Welshman was deprived or dispossessed of anything, without the lawful judgment of his equals, by our father King Henry or our brother King Richard, and it remains in our hands or is held by others under our warranty, we shall have respite for the period commonly allowed to Crusaders, unless a lawsuit had been begun, or an enquiry had been made at our order, before we took the Cross as a Crusader. But on our return from the Crusade, or if we abandon it, we will at once do full justice according to the laws of Wales and the said regions. (59) With regard to the return of the sisters and hostages of Alexander, king of Scotland, his liberties and his rights, we will treat him in the same way as our other barons of England, unless it appears from the charters that we hold from his father William, formerly king of Scotland, that he should be treated otherwise. This matter shall be resolved by the judgment of his equals in our court.